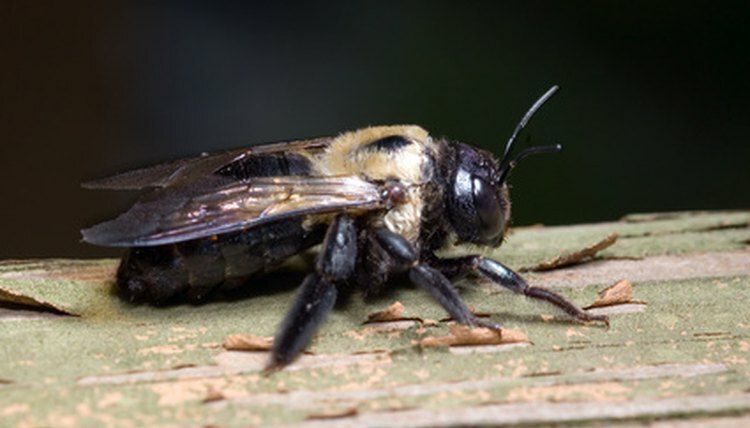 Carpenter bees, which belong to the genus Xylocopa, got their common name because of their habit of digging into wood surfaces to make their nests. This means they can be a significant problem for homeowners as their nests cause cosmetic damage, particularly if they build a nest in the same place year after year. Carpenter bees are not particularly aggressive, but stings are not out of the question. 1) Carpenter bees are between 3/4 and 1 inch long, which is a substantial size for an insect. As a point of comparison, that is about the distance from the end of your thumbnail to your first knuckle. 2) A Carpenter bee's thorax is furry, while the bottom side of their abdomen is bare and glossy. 3) Female carpenters have black heads, while males have black heads with white spots. 4) Male carpenter bees can be aggressive as they try to defend their nest, but this is just a show--in reality, only the females have stingers. 5) Carpenter bees hibernate through the winter in their nests and generally emerge in early spring (late march to mid April, depending on the region's climate). 6) Carpenter bees do not form colonies or hives like honey bees. Rather, the females build individual nests in which they lay eggs. Males do not live long enough to need nests. 7) Carpenter bees usually build their nests on unpainted softwood surfaces. These nests can cosmetically damage a wood surface, but they do not structurally damage it, as they are not big enough. 8) Females build nests in which to lay their eggs, but they prefer to use old nests rather than make new ones. This is because the process of building a nest in wood is time-consuming and labor-intensive. 9) Females build nests by biting right into the wood, against the grain. These nests will turn after an inch or so to make a tunnel. 10) Females lay their eggs in nests, then die. Children are generally born in August or so, but do not leave to do more than collect pollen until the following spring.